You know them by their single names: Fred and Ginger, Bogey and Bacall, Barack and Michelle- all couples whose relationships seem to exemplify happy couples. And now there’s more scientific research to confirm the value of happy relationships for a meaningful life. The 75-year-old Harvard Study of Adult Development (profiled in this previous agebuzz post) has conclusively found that a good relationship is the one constant that can give us a healthier and happy life as we grow old. And furthermore, recent research out of the University of California Berkeley reports that as couples in a relationship age, their bickering and differences retreat, and humor and acceptance become more important and prevalent. So if you can hang in there during the tough years, the payoff seems likely to keep you healthy, happy and in good humor. And speaking of good humor: Perhaps no movie has explored a relationship with humor more than Annie Hall, the 1977 Oscar-winning film starring Woody Allen and Diane Keaton. 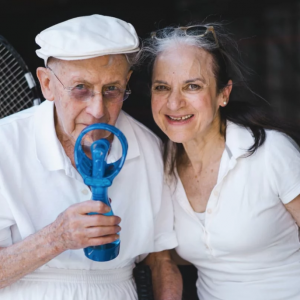 If you enjoyed Annie Hall, then you need to see “My Annie Hall,” the 2018 abbreviated remake of the film, starring 94-year-old Harry Miller in the Alvy Singer role and 74-year-old Shula Chernick in the role of Annie. It’s a joy to hear the laugh lines and poignancy of this comedic romance come out of the mouths of senior actors replaying the parts. To learn more about this remake and see the trailer for this new film, grab some popcorn and click here.